Ethiopian Press: A case study from the 2014 Human Rights and Democracy Report. We were concerned about continuing restrictions on press freedoms and freedom of expression in Ethiopia in 2014, including through use of the Anti-Terrorism Proclamation (ATP). Those detained under the ATP include members of opposition groups, journalists, peaceful protesters, and others seeking to exercise freedom of assembly or expression. In July, seven bloggers from the “Zone 9” group and three journalists were charged under the ATP. The case is ongoing. In October, the prominent journalist and editor, Temesgen Dessalegn, was sentenced to three years in prison. He is appealing his conviction whilst in detention. According to the Committee to Protect Journalists (CPJ), 17 journalists were held in detention in 2014 – up from seven in 2013, and the fourth highest number in the world. CPJ also believes that more than 30 journalists fled Ethiopia in 2014. The Ethiopian government stated that the journalists may return, and that it has no intention of charging them. In June, up to twenty journalists from the Oromia Radio and Television Organisation were dismissed, allegedly in relation to their critical views on student protests in the region. In August, five magazines and one newspaper ceased publication following the government’s decision to charge them under the Criminal Code in August. Studies by the Open Net Initiative and Freedom House have shown that access to electronic media is restricted. Dozens of websites, including international news sites, which feature critical content or cover sensitive political issues, have been either intermittently or permanently blocked. Other factors that work against a free media environment include challenges for private sector publishers to access affordable and reliable printing presses, and a lack of professional training for journalists. We have raised concerns about restrictions on media freedoms at the highest levels of the Ethiopian government. In September, at the UN HRC’s Universal Periodic Review (UPR) we recommended that Ethiopia take concrete steps to ensure that the 2015 elections are more representative and participative than those in 2010, including by encouraging open debate among political parties. Ethiopia accepted this recommendation and we are waiting to see what action they will take. 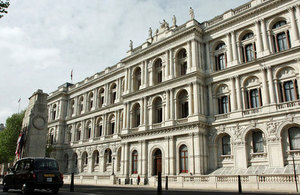 The UK also raised these issues regularly at the most senior levels of the Ethiopian government. We continue to attend trials which have implications for press freedom, in order to assess whether they meet international fair trial standards. In May and July, the EU issued joint statements reiterating the importance of political space and freedom of expression. The EU called for due process and respect for human rights regarding the detention of the “Zone 9” bloggers, journalists, and opposition figures. Freedom of expression is a core characteristic of any democracy. The UK believes that a more open environment, in which press freedoms are protected, will strengthen democratic accountability and contribute to Ethiopia’s long-term stability.